NPR Correspondent Ofeibea Quist-Arcton Reports On Her Breakfast With Anthony Bourdain : Goats and Soda Yes, he is intense. He has a lot of tattoos. And he absolutely loves Senegal. NPR correspondent Ofeibea Quist-Arcton shares breakfast with Anthony Bourdain at Marché Kermel in Dakar, Senegal. In the most recent episode of globetrotting chef Anthony Bourdain's travel-food show Parts Unknown on CNN, you hear a strong, female voice saying, "lakh, lakh." To many in the NPR audience, it may be a familiar voice. The plummy tones belong to Ofeibea Quist-Arcton, our West Africa correspondent, who's from Ghana and is based in Dakar, Senegal. 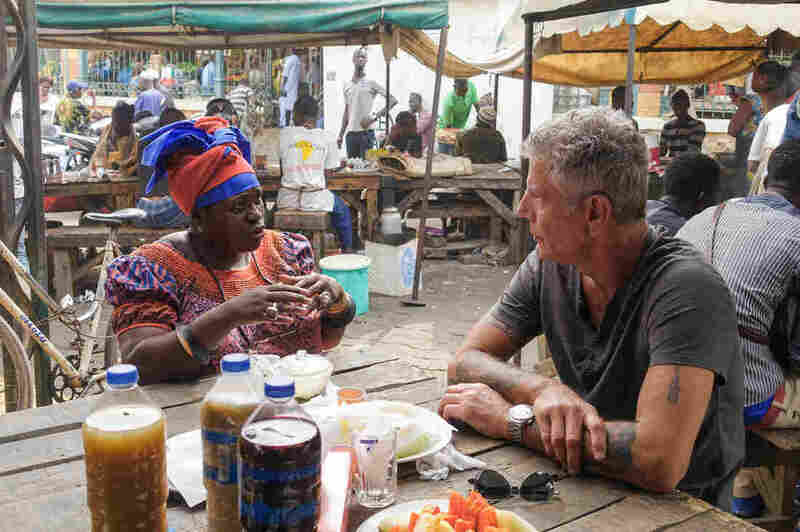 When Bourdain came to that country to explore its culture — and of course, its food — she met him for breakfast at the open-air market known as Marche Kermel in Dakar. Bourdain was clearly smitten with the nation. He called Senegal "enchanting." And he noted that the country has managed to avoid the coups, civil wars and dictatorships that have occurred with many of its neighbors. And that even though Senegal is a majority Muslim nation, its people elected a Catholic as its first president after independence from France in 1960. He said Senegal is one of those places that "leads you to believe maybe there is hope in the world." Quist-Arcton is equally enchanted. "The Senegalese are easy to get along with, and they care about you," she told Bourdain. "And I guess that's what we all want as human beings — to be loved and cherished. They welcome you, and for me that makes it a good place to live." We spoke to Quist-Arcton about her breakfast with Bourdain — and her love for Senegal. First of all, what is lakh? That's what we were eating. It's a breakfast or even an evening dish. It's like a yogurt with millet and a bit of vanilla essence and orange essence. This one had raisins. It's eaten especially during ceremonies — marriages, naming ceremonies, baptisms, christenings, funerals. It's delicious, creamy and rich, so it's like a meal! There were some bottles of liquid on the outdoor table where you ate. What were they? Freshly made fruit juices. The Senegalese make juice from just about every fruit you find — the baobab [bouye], the tamarind [tamarin], red sorrel [bissap], mango, pineapple, ditakh. Their juices are totally delicious. We had ginger (the Senegalese call it by the English name, pronounced jinjehrrr) baobab and bissap that morning. Bourdain was clearly impressed with the people of Senegal. What makes them special? The Senegalese welcome outsiders. They are generally kind, hospitable and generous and they're interested in others. And Senegal is a tolerant country. It is 95 percent Muslim, give or take, with a Christian minority, and these communities live in harmony. All holy days are public holidays, whether Muslim or Christian — Ramadan or Christmas. You'll find during Christian holidays that involve food, the Christians share their meals with the Muslims, and the Muslims share their food when it's a holiday like Mawlud, the prophet's birthday. What's the secret to Senegal's harmony? The Senegalese always tell me that peace is paramount. They make living in peace a priority. Senegalese are quite conservative but they don't impose anything on you, don't try to convert you to anything. They respect who and what you are and get along with you. They want to learn about you and your culture and where you come from. And they want you to know about their traditions and customs — and learn their languages! And they love to play music and dance up a storm. So do I! You've recently done radio pieces about the young men of Senegal who are part of the wave of African migrants to Europe and beyond. If Senegal is so wonderful, why are these men leaving? Senegalese are proud of their country, but there's also poverty and that's what many people say pushes these young men — and increasingly some young women — to emigrate or to try. There's a lot of pressure on young men especially to go and make their fortune abroad, so they can build homes for their families and help them financially. But without the right documents, you can land in hot water or worse, perish in the Mediterranean or the Sahara Desert en route. Food was a big topic on the show. Any thoughts you'd like to share about the local cuisine? The Senegalese cook well and enjoy good, healthy food — lots of vegetables, fish and seafood, though a little too much rice for this Ghanaian's palate! One other thing — they generally eat communally, from one dish, which I like — and it's an excellent way to teach children good table manners and etiquette. What was your impression of Anthony Bourdain? He seems like a very intense guy. I didn't meet him for very long. An hour or two. He is pretty intense, I guess, but positively intense. I got the impression that he's passionate about people and that shines through the intensity. He wants to learn everything about a country he's exploring! I have the impression that he's fascinated by people and by food and by culture. And politics! He feels like food gets to the heart of a culture. He did say he's traveled around Africa and the world, but he's never been to a country quite like Senegal. I can quite understand why he's captivated. I am too! Monsieur Bourdain has a lot of tattoos on his arms. Yes, quite a few. You don't see much of that in Africa. We have henna skin decorating and painting here, and I meant to suggest to him to get a lovely abstract henna decoration, but his arms were already pretty covered in tattoos. Oh yes — and his eyes lit up when he talked about his daughter. That immediately endeared him to me. He loves to cook for her. Since TV is a visual medium, can I ask about your garb? You were wearing a colorful head wrap and a long dress with a red and blue pattern. That's my everyday clothing. I wear a lot of head ties. I love head ties and hats. I love the batik fabrics in West Africa — in Senegal it's called "thioup" — pronounced "choop." I love the colors of Africa. Indigo is my favorite color. I have to say the chic little black dress business doesn't do it for me. No interest. Why would I wear black when there's tomato red, burnt sienna orange, pea green and sky blue? So these vivid colors are part of Senegalese fashion? I think the Senegalese are some of the best dressed people in the world. One of the most gorgeous sights in Senegal is of men and women dressed in Friday best — for their weekly Muslim prayers. The women look stunning — gorgeous in their boubous [traditional gowns] and foulards [head ties]. The men look equally glorious in their boubous. And they're not wearing boring black. They're more colorful than a rainbow.